The Braves' starting five appears set for now, but the next man up may not be who you thought it would be. Scott White shares his top prospects to stash. Normally, for the lede of my Prospects Report column, I focus on a player making waves recently. Maybe he just got called up. Maybe an opening just developed for him at the major-league level. Or maybe he's so sizzling hot that speculation is beginning to build. Today, though, I choose to focus on why two of the most drafted prospects in CBS Fantasy leagues are no longer among my top five to stash — both of whom who happen to be in the Astros organization. Which is part of the problem right there. The Astros have perfected the modern rebuild, not only establishing an elite core but supplementing it with a seemingly endless supply of prospects. Their excesses are apparent just on the major-league roster, where Tyler White hasn't gotten nearly as much playing time as we thought he would and viable rotation options Josh James and Framber Valdez are on the outside looking in. With that in mind, how long before we actually see Kyle Tucker and/or Forrest Whitley? Whitley is the one with more roadblocks, but of course, a 162-game season has a way of chiseling away at pitching depth. I still suspect he'll get the call at some point, but given the number of healthy pitchers ahead of him in the pecking order, it's not going to happen so immediately. We'll have either a rash of injuries or a stretch of dominance as forewarning. The concerns for Tucker are as much about performance as opportunity. After a disappointing major-league trial last season, he was virtually invisible this spring and has begun the minor-league season 2 for 22 with nine strikeouts. Granted, he's the same guy who hit .332 with 24 homers and 20 steals at Triple-A last year, so from a long-term perspective, there's no cause for alarm. But after his brief trial invited whispers of him not being ready, he's going to have to keep producing to get his next look. Even if White and Tony Kemp both went down with injuries today, I imagine the Astros' first inclination would be to roll with Aledmys Diaz instead. I'm not trying to dampen enthusiasm for Whitley and Tucker or suggest they're not the prospects we thought they were. They would probably both be among my top 10 prospects to stash. I, myself, own Tucker in both of my five-outfielder, 15-team leagues and have no intention of dropping him. The exercise, though, is to narrow down the most stashable prospects to a list of five. And given how widely owned both Whitley and Tucker are, I thought it was worth explaining why they're off that list for now. Guerrero is healthy again. His rehab assignment for high Class A Dunedin is over. The Blue Jays moved him up to Triple-A Buffalo, where he homered in his first game. They'll give him some time to find his timing, but the timing of his recovery is still pitch perfect as far as service time concerns are concerned. "If he goes [to Buffalo] and he's hot and swinging the bat good, there's no reason for him not to come here," Blue Jays manager Charlie Montoyo told MLB.com in early April. Guys, the day is nigh. This progeny of a prodigy, the most prized of prospects in my days of prognosticating prospects, will have his proper introduction, his propensity for putting the ball in play presenting a problem for pitchers otherwise predisposed to punching out players with his prodigious power. Sorry, I'm running out of ways to say how good he is. While Guerrero's rehab assignment has ended, it doesn't sound like Senzel's is particularly close to beginning, with manager David Bell saying it's probably a couple weeks "before he's playing in games anywhere." Senzel is out of the walking boot, though, and clearly on the road to recovery from his sprained ankle. So why stash him if we know there's a wait? Well, we pretty much know what the wait is. The Reds will want him to get his legs back under him, get his timing down, but there isn't much question he's ready for this opportunity. And whether it's filling Scooter Gennett's vacancy at second base or forging ahead with the transition to center field (it's not like Scott Schebler has that job on lockdown), there will be an opening for him. We'll see him in May. The wait for Luzardo figures to be even longer than for Senzel given that we've yet to receive an update on his status following the initial four-to-six-week timetable for a strained rotator cuff. Like Senzel, though, it's pretty clear what's happening to him when he's healthy. Among starting pitchers this spring, he was right there with Chris Paddack in terms of eye-opening performances and was presumed to be a front-runner for a rotation spot all along. The Athletics rotation has no shortage of landmines, and by the time Luzardo is full-go — let's say June 1 — the season will have shrunk to a point that the Athletics no longer have to be so careful with his innings. Though GM Mike Rizzo has already said he wanted to continue transitioning Kieboom to second base, knowing that's where his future is with Trea Turner holding down the shortstop position, Rizzo also said the bat is "very, very close to becoming major league-ready." Kieboom then went and nearly hit for the cycle Monday. You have to wonder how much of a hot streak it would take for the Nationals to throw caution to the wind like they did for Juan Soto last April and make Kieboom the fill-in at shortstop, trusting that a new opening will develop once Turner is ready to return. They're looking at a few more weeks without Turner, and Wilmer Difo is giving them nothing. In a hotly contested NL East, it could make all the difference. Max Fried appears to have locked down what would have been the Braves' one rotation opening once Mike Foltynewicz is back to full health, but those next in line — the Kyle Wrights, Touki Toussaints and Bryse Wilsons of the world — haven't exactly advocated for themselves. Meanwhile, Soroka, who was the initial front-runner for the fifth starter role before shoulder issues popped up this spring, is healthy again — so healthy he threw five perfect innings in his debut for Triple-A Gwinnett. "It felt awesome. It felt really good to go out there and compete. Just going out there and giving it everything you got again was great," he said. "It'd been a while since I was out there and I was happy to leave the mound healthy." All it would take is a couple bad outings for Fried, continued control problems for Sean Newcomb, or an injury to any one of the starting five, and Soroka is back in the majors. And with the high marks he earns for both command and polish, he might just stick. Alvarez's approach made him a top prospect two years ago, and the power began to pick up last year. He seems to have found another gear in the early going this year, homering three times on the second day of the season and twice more since. Could the 21-year-old actually leapfrog Kyle Tucker should the need for a minor-league bat arise? The upside may just as enticing. 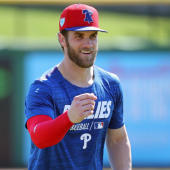 "His plate discipline and ability to hone in on a certain pitch and ability to lay off other pitches, that's what's really impressive — when he tightens it in on the zone and he's only going after whatever he's committed to and he won't flinch at anything," Round Rock hitting coach Ben Rosenthal told MLB.com. "It's like he's putting all of the pieces of the puzzle together and connecting all these dots. It's cool to see him do that and take off." Speaking of putting the pieces together and taking off, whatever luster Robert lost during an injury-plagued 2018 he seems to have restored threefold, connecting for his fifth home run in seven games Monday after hitting none in 50 last year. Whether those struggles were the product of a banged-up wrist or just a case of needing to refine his tantalizing tools, the plus-plus power that scouts projected for him is manifesting now. And speed may actually be his best tool. The 21-year-old most likely won't be up this year, but he's back to being a dynasty league darling. You see the 0.42 WHIP there, but I prefer to break it down this way: two hits, three walks. Manning's most recent start Wednesday was a seven-inning, one-hit gem in which he walked none and struck out 10. Though unquestionably a prospect, he hasn't risen to the level of some of the elite hurlers despite consistently high strikeout rates (nearly 12 per nine innings for his career), and control is a big reason why. At 6-feet-6, he has struggled to find a consistent release point, but this start could be our first indication of him turning the corner. Gallen took a step back in his first season with the Marlins last year after impressing in the Cardinals organization two years ago, but he may have gotten to the root of the problem: an inconsistent arm slot. Sticking to more of a three-quarters delivery rather than drifting to something more over the top should help his plus command play up, and it made him literally unhittable in his season debut for Triple-A New Orleans Friday. He struck out eight and walked non in six one-run innings next time out, and that's after recording 12 strikeouts vs. one walk in nine innings this spring. Clearly, there's something to build on for a pitcher who's nearly major league-ready. De Los Santos attracted some attention in Fantasy when the Phillies called him up for a couple starts last July. At the time, he was sporting a 1.89 ERA, which, as you can see, normalized to some degree the rest of the way. The fastball-changeup combination is interesting, but his slow-to-develop breaking ball has limited his strikeout potential to this point. Clearly, his first start was a step in the right direction, and if it continues, he could position himself as the next man up.